My legendary love affair with bacon began at a very early age. It is something that I could easily eat not just for breakfast, but for lunch and dinner too. 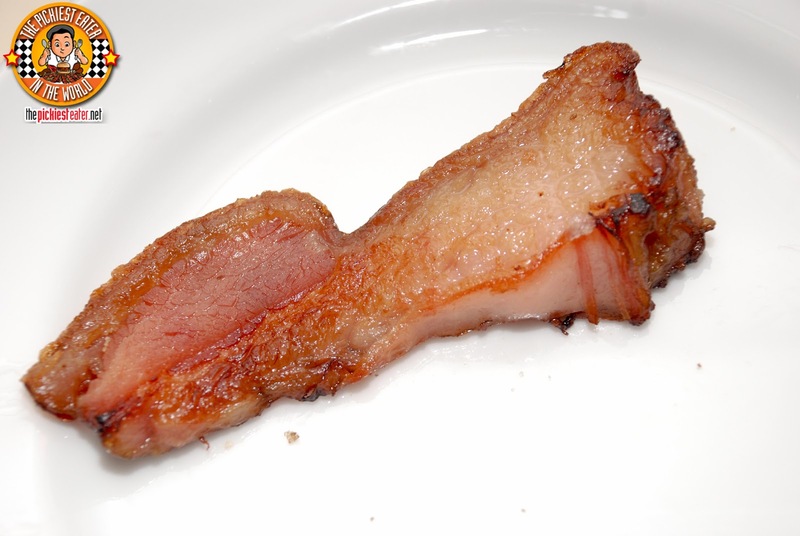 People think I'm joking when I say I would prefer a plate of bacon over a USDA Grade Tenderloin Steak, but it's true. Crunchy, soft, thick, thin, it matters not. 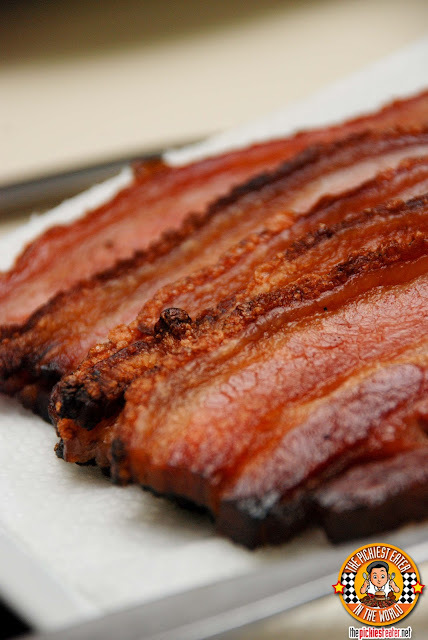 Growing up in a family thats into the hotel business, I've been fortunate enough to have experienced a lot of breakfast buffets in my lifetime, and the first thing I always seem to look for, no matter what other amazing dishes were laid out, was the bacon. So when my wife told me about her friend's home-based business that specializes in different types of homemade bacon, I was immediately intrigued. I know some home-based Tapa, and even sausage vendors, as well as a wide array of pastry sellers, but surprisingly, no bacon. Rina didn't really need to twist my arm to get me to order a batch to try, saying it would be a nice change to blog about another home based business instead of a restaurant for a change. I told her that if I didn't like it I wouldn't blog about it. So ladies and gentlemen, you're about to thank me for introducing you to the best bacon you've never heard of... Mad Meats. I don't pretend to be the leading expert in Bacon.. a "Baconneisur" as my friend Leslie calls it.. but since buying Bacon has become a hobby of mine. I actually buy different brands of bacon at the grocery in the hopes of finding out which is the best. Unfortunately I'm limited by what is available at the grocery. 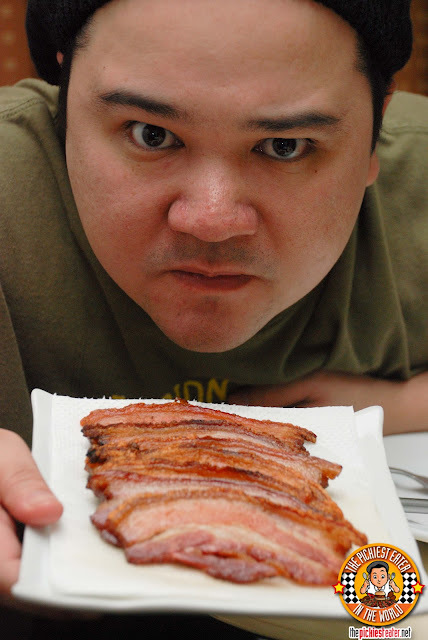 Mad Meats is the brainchild of my wife's high school batchmate, Martin Adriano who honed his craft at the Center for Asian Culinary Studies. I know this guy takes pride in his work because he asked Rina to give him a little more time for our order, because he wasn't satisfied with the curing process just yet. I appreciated that he takes his preparing bacon as seriously as I take eating it. 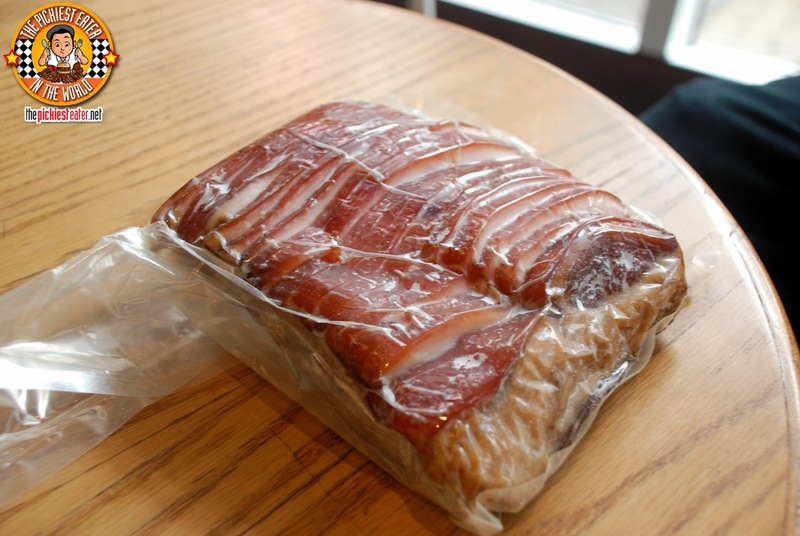 Mad Meats smokes the bacon by using a variety of woods, depending on its availability. The types of woods can range from Santol, Caimito, Mabolo, Cinnamon, Mango and Narra. For my batch, Martin used Mango wood to enhance the sweetness of the smoke. 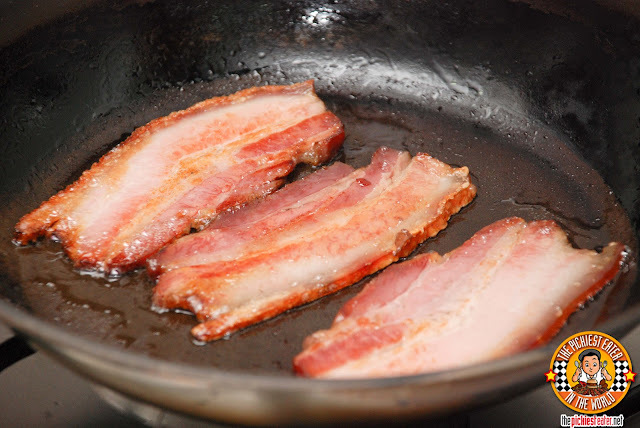 I just gently laid out the bacon strips in a pan and watched it sizzle. The aroma alone was enough to send my belly growling like a grizzly bear. 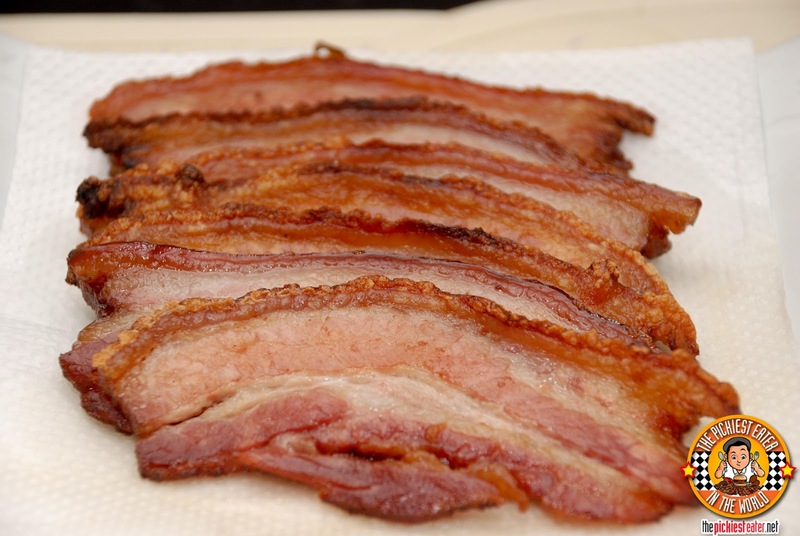 The cuts were slightly uneven, however that's exactly what helped add to the bacon's charm. Apart from the fact that it was, of course, bacon. 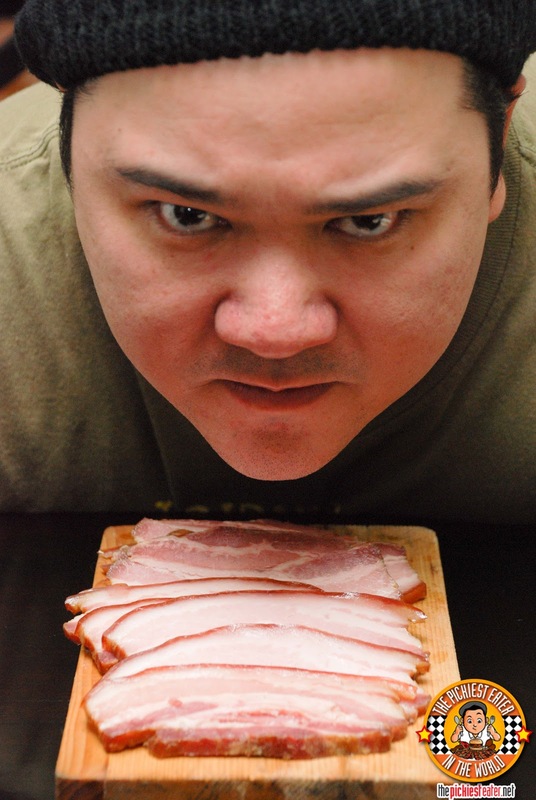 The cuts were a lot thicker than regular bacon, making it seem almost liempo-like. Because of it's thickness, you can't really get it as crispy as thinner bacon without drying it up or burning it. But we did manage to get the ends to a nice crispy texture, with the skin on top letting out an awesome crunch. 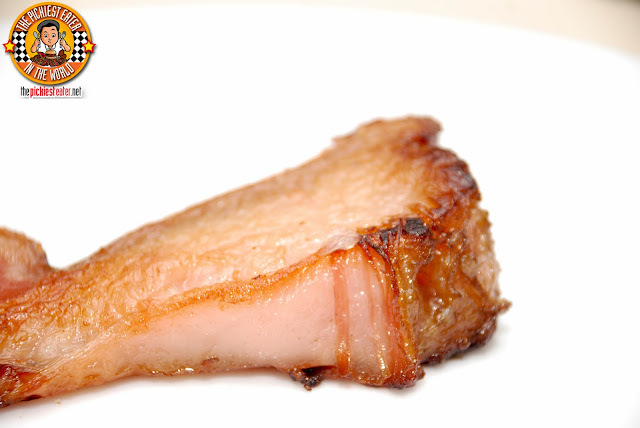 I made sure to get the "burnt end" part of the bacon, which had the biggest chunk of fat. And when I say big, I mean BIG. Anyone else here a "Taba" lover? 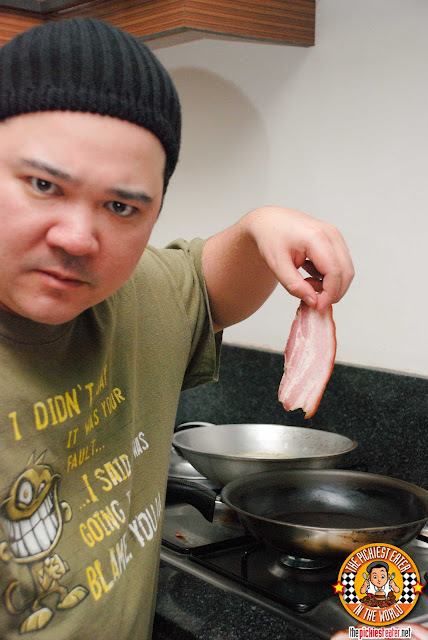 Our friend, Dreaming of Dinner, experimented with the bacon, making an ice cream dish and pasta with it. Every time I would suggest a dish to Rina, she would politely decline. So we would always end up just eating it straight up with fried rice and french fries on the side. any other way than in its natural state. 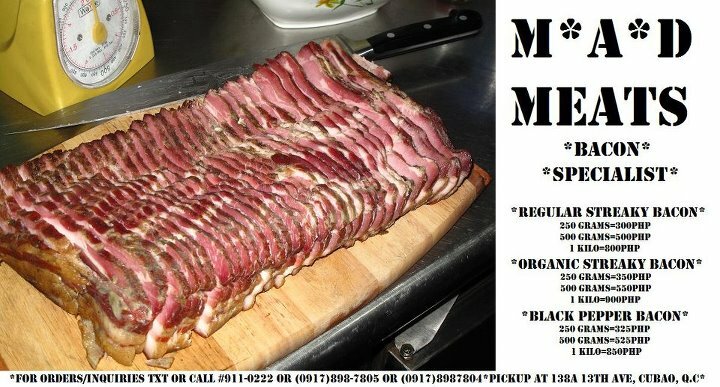 Mad Meats is definitely the Limousine of the Bacon world. but you won't find quality like this in the supermarket. Throughout this entire pictorial I tried staying in character and being "MAD" the whole time.. But in the end, Bacon just brings a smile to my face!! 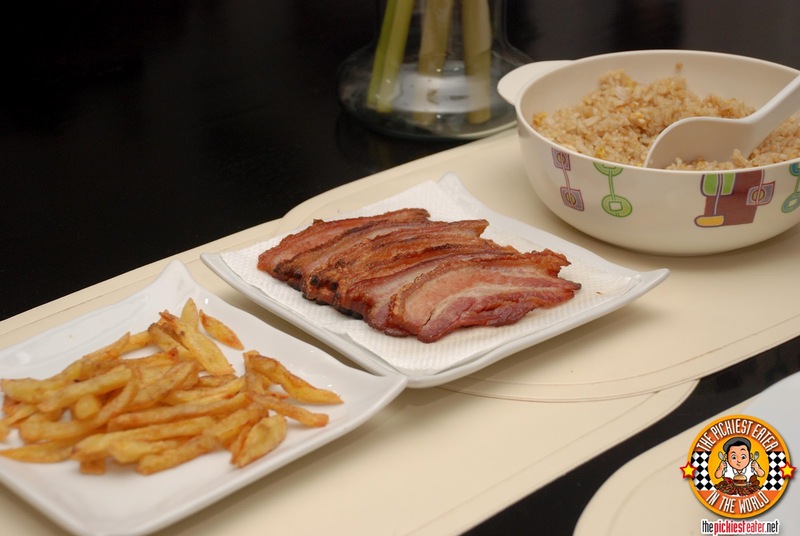 we love mekeni bacon too! That's too fatty! :D My parents will hate me if I bring one home.haha. (They're avoiding salty and fatty foods for health reasons). Sumi, in all honesty, the fat to meat ratio is quite balanced, except for the ends, which is the ones I reserved for myself hehe.. Cookies, Mekeni bacon is quite good, especially for its price! I recommend serving those bad-boys the way the Scots do: don't drain them after frying (so they keep some of the drippings) and serve them over a huge mound of mashed potatoes! Your comment made me well up a little, Midge.. Sniff.. that sounded beautiful! 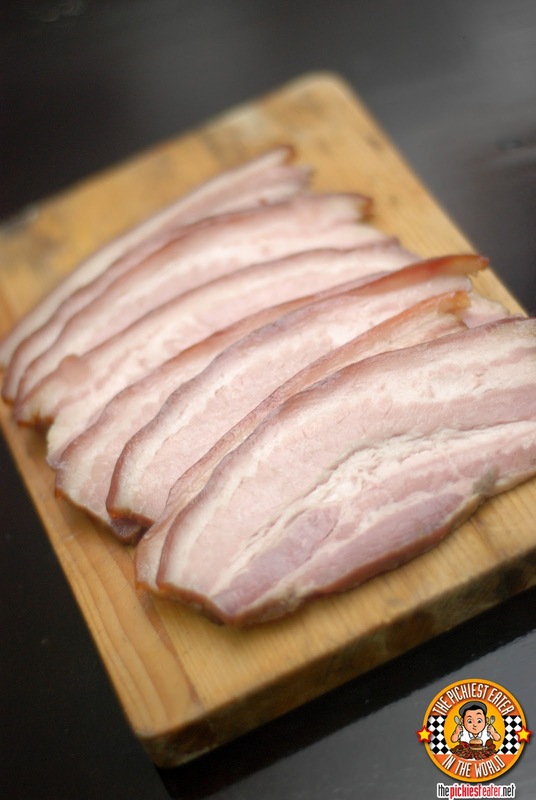 Have you tried Earle's double smoked bacon? Because I found those to be good too and relatively cheaper among delicatessens. M, I have not but I'M GONNA!! THANK YOU! Oh my! It's so near. I gotta try this. 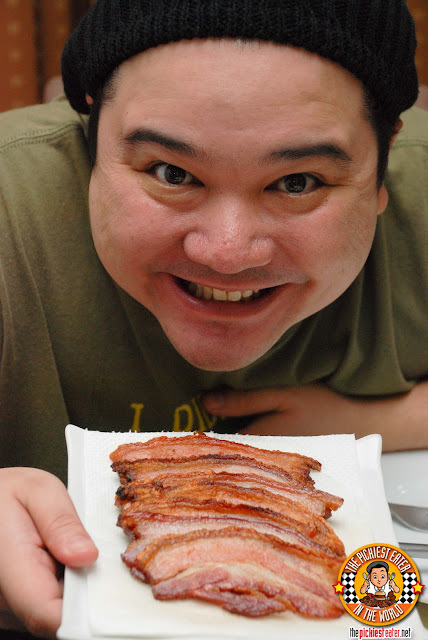 I Love Bacon!! Craving now for M.A.D Meats Bacon.